Our inspiration for creating this process for law firms came from the book by Khalsa, Mahan. Let's Get Real or Let's Not Play: Transforming the Buyer/Seller Relationship (Kindle Locations 985-988). Penguin Publishing Group. Kindle Edition. We highly recommend this reading to anyone with a serious interest in creating organically developed new client relationships. An Opportunity Analysis is an execution tool that consists of a detailed review of a prospective client’s needs, constraints, and operating environment. It is both a strategic and tactical document. It is more specific than other other elements of a marketing plan such as content development and relationship building. The analysis is conducted once an opportunity is brought forward by a prospect, who in turn has been identified through primary marketing activities. While these marketing initiatives may raise a prospect's interest in the firm, turning them into a client is a long shot without proper execution. Law firms often refer to the sales and marketing processes with the terms "business development or "procurement". An Opportunity Analysis is a “procurement” tool, and it is used to understand a prospect’s needs and intentions, which facilitates the development of a connection between the lawyer and potential client. In some instances, attorneys benefit from prior knowledge of the prospect’s situation, through previous direct contact or through a submitted form. If a prospective client is sitting in front of you discussing their issues, your chances of success are pretty good. We recommend keeping it simple in these situations and reverting to internal intake processes, assuming they exist, to establish the relationship. Many other situations require proactively seeking new business and trying to generate demand from less motivated prospects. Demand generation is difficult, can take a long time, and often results in seeking business from clients who believe that their current provider is doing well. In these instances, an advanced procurement process is most helpful. 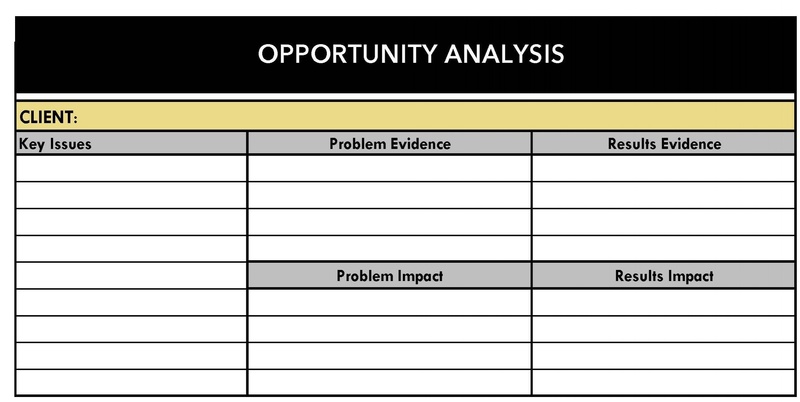 When is an Opportunity Analysis most helpful? Recently, we encountered Jan Roos, who is a legal marketing expert and author, and in his book, The Legal Marketing Fastlane (available on Amazon), he makes a helpful point that is relevant to this discussion. The first is the 20/60/20 distribution. In this context Jan suggests, assuming a basic level of marketing competence, that 20% of new client opportunities are attainable without an advanced sales process. Clients in this group have an issue and believe that you can solve their problem before contacting you. Reversing the situation suggests that regardless of the approach you take, 20% of new client opportunities are either not real or not attainable. If you accept this rationale, 60% of new client opportunities will require an advanced marketing and sales process. In our own experiences, Jan’s point is valid. The potential clients who have an issue and determine that you are the solution are the ones most naturally acquired. As long you do not fumble, you will get the business. While I am not certain that this situation occurs in precisely 20% of the instances, I can say that say that easy new client account opportunities are few. .
To tap into the 60% of opportunities that require an advanced sales effort, the Opportunity Analysis tool, and the accompanying process can make a difference and improve the likelihood of success. At the start, it is important to keep the discussion on track, which is difficult if a prospect has a lot of pent up frustration. Dwelling on any one area too long increases the chances of an unproductive meeting. We recommend 30-45 minutes for the process. An example of the first part of the form is shown below. Before meeting with a prospect, we recommend trying to complete a pre-call draft opportunity analysis. If you don’t know the answers to questions the form suggests, you are very early in the process and have much to learn before you can turn this prospect into a sustainable client relationship. The first part of the analysis focuses on the prospect’s issues. Identifying a prospective client’s key issues requires insightful and generally open-ended questions. It is important to seem at ease during this part of the process and to avoid appearing programmatic. We recommend clearing any preconceived notions about what is good and not good is a selling situation. Some believe that the prospect should do all the talking and others believe that they must do all of the talking. The goal of this process is to stimulate a higher-level conversation about the things that matter most (in context) to your client and making yourself relevant requires listening and speaking. Considering each issue in detail is typically not possible in one sitting, so we recommend picking one or two for further discussion. We understand that it is often difficult to limit a discussion once it starts, but you really have no choice. Remember that you are only just starting this relationship, and it is more important that your prospect understands that time spent with you is productive. Once you pick the key issues, move into a discussion of how the prospect becomes aware that the issue has caused a problem (problem evidence) and how this problem impacts the organization and the prospect directly. If the meeting is going well, the prospect will start offering more candid information, and you will start to feel your awareness and confidence increasing. When this happens, you have a chance to become relevant. Do stop here, press on to discussing potential solutions and the impact of those solutions. Moving to a discussion of solutions and results (happy feelings) from issues and problems (stress) is where it all must come together. This is the part of the process where you become most relevant. If you set yourself up for success when selecting the issues for further discussion, you are in good shape. When discussing solutions, take care not to start throwing out your fixes for all their problems. This part of the process works best if you allow the prospect to imagine their own solutions. Your job is to ask knowledgeable questions that expand the discussion about potential solutions. End with a discussion of how any of the potential solutions can positively impact the organization and prospect directly. If the call results in a logical next step, it went well. At this point in the process, the most you can realistically expect is that you made a favorable impression, are a potential solution, gained a deeper understanding of the client’s issues, approach, and environment. If you have a good content strategy, you can maintain your relevance by regularly following up with helpful information. 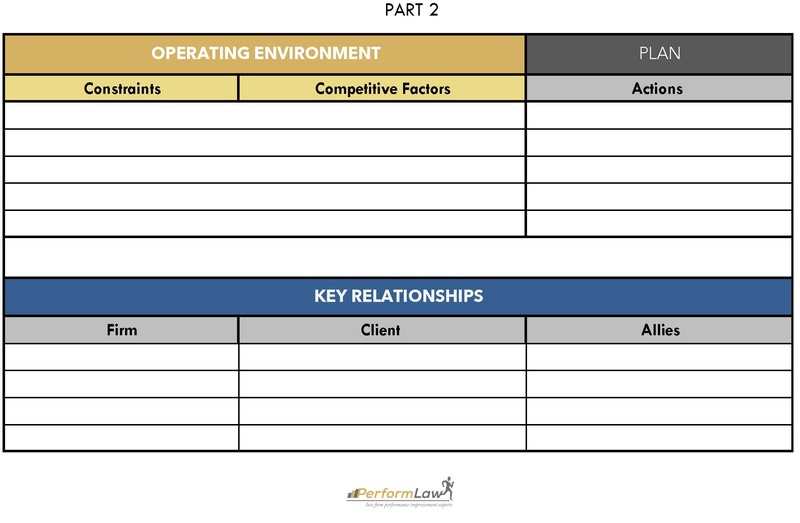 The second part consists of your position and action steps necessary to win the client. It is important to determine all the factors influencing the prospect’s decision-making process. Determine any constraints or limitations on selecting legal counsel. For example, these can include money available to spend on legal matters, panel approval, approval process, etc. Additionally, it is helpful to understand the competitive factors influencing the decision. Which other firms might be able to handle the case and whether the prospect is also considering other firms? Evaluate yourself against the competition, anticipate challenges, and formulate actions to identify your differentiating qualities. Determining key relationships with direct or indirect influence on the decision-making helps to apply the action steps effectively. On the prospect’s side, key relationships in a corporate relationship could consist of co-workers, superiors, consultants, etc. Key relationships is an individual matter could include spouses and other family members, friends, and other professionals, etc. On the attorney’s side, other attorneys and even internal support staff can help close the deal. External contacts can also help. For example, referral sources, testimonials, and references can get you over the top. To prepare for a consultation or meeting with the prospect, we recommend doing as much advance work as possible. Optimizing your time with a potential client requires fewer distractions. Asking trite questions or questions that, with a little advance effort, you can answer yourself wastes valuable time. Focus on the process: issues, problems, impacts, and solutions. Formulate your questions with these stops in mind. Procuring new business in a law firm environment requires a sophisticated approach. Effective business development fundamentals such as an opportunity analysis can increase the opportunities for attorneys willing to use this tool.